Portugal is a Top Trending destination. Europe's oldest city and UNESCO World Heritage Site ... Lello Bookstore, inspiration for Harry Potter books ... Port wine tasting in Vila Nova de Gaia ... and much more! Grab a paddle and see Lisbon from a different perspective on a canoe or kayak tour along the waterfront! Escape from the busy city for an afternoon and join us for a horseback riding tour on the beach! This three-hour tour will connect you with nature as you are guided across meadows, dunes and coastal forests on the Costa Alentejana. This tour is open to all skill levels and guides will ensure your safety throughout the tour. Design today your way! Algarve Beaches provide the perfect setting for any water-based activities, so choose your favorite! 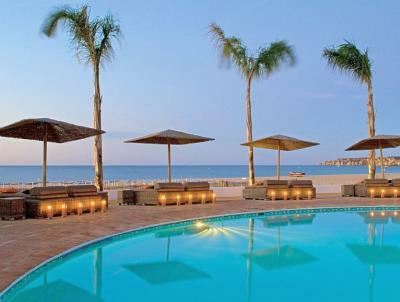 Options include kayaking, surfing, and much more! Watersport options are available to all skill levels. Switch to a different mode of transportation today and join us for an all-day bicycle ride through the Duoro Valley vineyards. Ride through historic villages and along UNESCO World Heritaged terraced vineyards to experience the traditions of the region. Reward yourself as we visit a wine cellar and taste some of the best port and Duoro wines with a hearty lunch. From the historic cities of Porto and Coimbra, to the rich cultural center of Lisbon and striking beaches of the Algarve, Portugal offers history, stunning architecture, amazing food and wine, plus unlimited adventures for adrenaline seekers. Today, we embark on our overnight flight to Lisbon, capital of Portugal. The history and traditions of Lisbon and New World discoveries will be unveiled on our afternoon walk with a local historian. Delve into the city’s historic Alfama quarter rich with Moorish tiled buildings and narrow, cobblestone alleyways. Walk through the Belém district from where sailing ships once set forth to find unknown lands. Admire the Discoveries Monument honoring Henry the Navigator, who led Portugal’s expeditions into the New World in the 15th century; then marvel at the UNESCO World Heritage-listed Jerónimos Monastery. Tonight we meet fellow travel companions at our welcome dinner and plan our journey ahead. Enjoy a free morning or consider a guided canoe or kayak tour of Lisbon’s waterfront. Paddle past Catalazete´s Fortress, São João das Maias´s Fortress, Giribita’s Fortress and St. Bruno Fortress. In the afternoon we visit Sintra, a fairytale-like town with its UNESCO World Heritage Sintra-Vila. Streets are lined with pastel colored houses wrapped in lush hills that roll down to the Atlantic along the coast. Some of the must-see sights are the colorful Pena Palace, built in the Romanticism style, the Gothic Palácio Nacional, and the ancient walls of Castelo dos Mouros, perched high above the city. Visit the Quinta da Regaleira estate containing an extensive and enigmatic system of tunnels. Its “Initiation Well” is a steep 27-meter staircase that leads directly underground and connects with other tunnels via a labyrinth of underground walkways. Upon return to Lisbon, enjoy your leisure evening. During free time this morning, consider a ride on the Tram 28 that takes you through some of the city’s most prominent neighborhoods to see popular attractions such as St. George’s Castle. The funicular railway travels up steep hills of the old town for more exploration of Alfama’s winding streets past charming shops, cozy restaurants, exotic gardens and traditional Fado clubs. This afternoon we start our journey south along the coast to the famous Algarve region. We stop in Sines, an old fishing town and the birthplace of the explorer Vasco a Gama. Relax by the water or join us on an optional horseback ride across meadows, dunes and coastal forests on the Costa Alentejana. Afterwards, we continue to Cabo San Vincente, Europe’s southwestern most point and a spot with spectacular views before we arrive at our beach hotel. The alluring coast of the Algarve receives much attention for its spectacular cliffs and sun-kissed beaches. It offers endless opportunities for adrenaline seekers and water sports fans, as well as those in pursuit of just relaxing on the beach. The delightful inner Algarve features quaint castle towns and villages, flower-covered hillsides, and amazing hiking trails. We will start our day with a yoga class on the beach. Then, design the remainder of the day depending on your energy level: kayaking, surfing, hiking or swimming are just some of the options available. Tonight we share stories of this day’s adventures at our very own beach party. We start our drive north to Portugal’s second largest city, Porto. En route, we visit Coimbra, located in the heart of the country. Coimbra has been the medieval capital for over 100 years and is the oldest University City in the country. Tour the university grounds, which UNESCO has placed on its list of World Heritage sites, climb the tower for a birds-eye view of the city, visit Pátio das Escolas courtyard, the Chapel of São Miguel with an imposing Baroque organ, and the Joanine Library featuring over 300,000 works dating from the 16th to the 18th centuries arranged in beautiful gilt-covered bookcases. We arrive in Porto for a welcome dinner of Portuguese delights. Our local historian takes us on a discovery of Porto this morning. The city town center is one of Europe’s oldest and registered as a UNESCO World Heritage Site. Admire monuments such as the Luis I Bridge and Porto Se Cathedral, Torres, Igreja dos Clerigos, and Avenida dos Aliados. We end our tour at the famous Lello Bookstore. Even if you are not into books, you don’t want to miss this exquisite 1906 neo-Gothic construction, with its carved plaster resembling wood and stained-glass skylight. Its intricately wrought, spiral staircase was supposedly the inspiration for the one in the Harry Potter books, which JK Rowling partly wrote in Porto while working here as an English teacher from 1991 to 1993. Vila Nova de Gaia, considered the Port Wine capital, is just across the Douro River. Lodges of the historic port wine producers are strung along the waterfront with their caves, aging tanks, and tasting rooms. After some free time, join us for a tour and tasting of this delicious, sweet red wine. Take today to further explore Porto and its surroundings on your own, or join us on an optional all-day bike ride through the Douro Valley vineyards. Ride through historic villages and along UNESCO world heritage terraced vineyards to experience the traditions of this region. 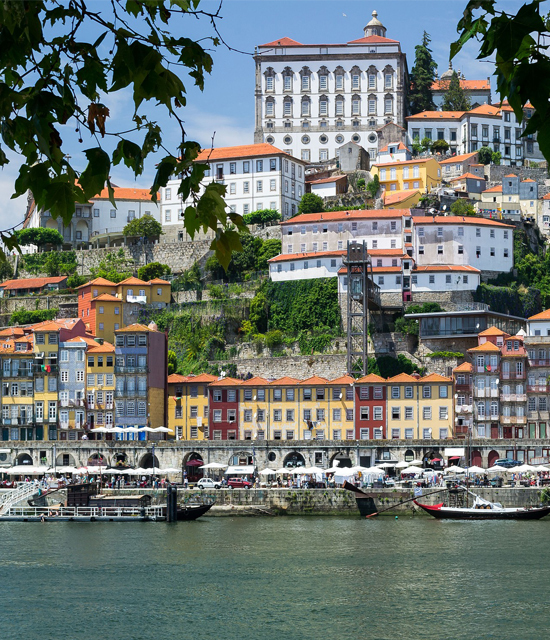 Visit a wine cellar, taste some of the best port and Douro wines, and enjoy a hearty lunch. We return to Porto with some time to relax before our farewell dinner and opportunities to listen to Portugal's soulful national soundtrack: Fado music. After breakfast our land program ends and we bid farewell to our new-found friends and fellow adventurers. Seeming to float on the Tagus river, this castle was once used for protection in the 16th century. Admire the tower’s architecture and peculiar location from afar, or take a tour of the interior! 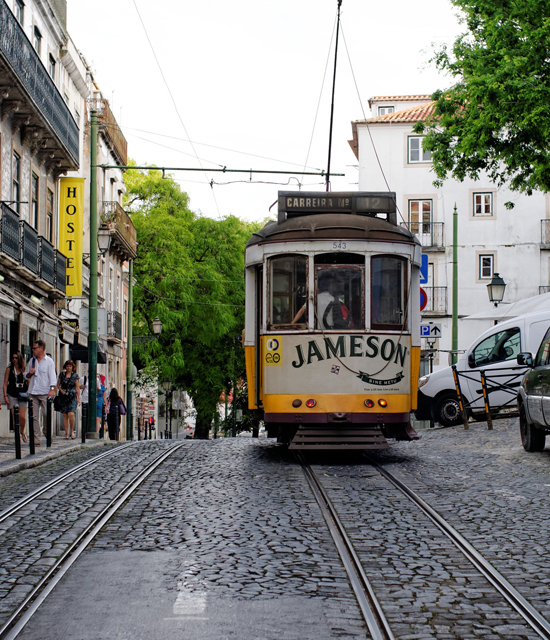 Like cable-cars in San Francisco, Tram 28 runs up and down (literally) the steep streets of Lisbon. Catch a ride from point A to point B, or just to enjoy the ride! Situated high on a hill, this castle can be seen from nearly anywhere in Lisbon’s historic center. It was first built nearly 2,000 years ago and displays the Portuguese royal seal in the entryway. Catch the tram up the hill or challenge yourself to the climb and be rewarded with amazing views and an on-site restaurant! Get up close with underwater wildlife at the Lisbon Oceanarium, Europe’s second-largest aquarium! The Oceanarium is home to over 15,000 water-creatures, and the building itself “floats” above the ocean, only accessible by foot-bridge! This beautiful coastal setting is accessible by boat or foot, just a few minutes south of Lagos’ center. By boat, you will arrive through natural caves and arches, while on foot your journey will take you along cliffs and down a steep staircase to the beach. Church of Santo Antonio – Lagos was originally build in 1707 and features incredible wood decorations on all walls. In addition to the beautiful walls and statues inside, look up to see the wooden, vaulted ceiling and intricate prints it displays. Head here to kick-start any watersport adventure, or just to enjoy the social atmosphere! The marina is not only the launchpad for many water-based activities, but also home to countless bars and restaurants where you can sit back and enjoy the view. Take a stroll across this famous bridge, designed by the student of Gustave Eiffel, creator of the Eiffel Tower. The bridge has two levels, the lower for cars and the upper for Porto’s metro. Pedestrians can walk alongside either level for incredible views of the city and Duoro River. In the shadows of where the Crystal Palace once stood, torn down in 1956, now stand beautiful gardens and walkways. Walk through green trees and colorful flower beds, around fountains and alongside the Duoro River. Though no longer in use to direct ships safely to shore, the Farol Molhe do Duoro lighthouse stands tall on the coast of Duoro, at the end of a promenade full of coastal trees and restaurants. For the best views, visit near sunset on a clear day. 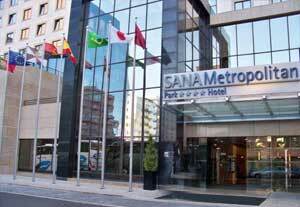 The 4-star SANA Metropolitan Hotel is located near Praça de Espanha. Room amenities include satellite TV and a modern bathroom. Just a quick walk from Meia Praia Beach and featuring a large outdoor courtyard with swimming pool, guests can relax and enjoy the views. In addition to an indoor restaurant, the hotel also features an outdoor grill serving Portuguese cuisine. The hotel offers free WiFi. The Star Inn Hotel offers modern accommodations, stylish décor throughout and free internet access. 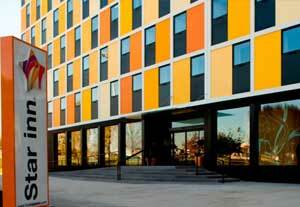 It features air-conditioned rooms equipped with flat-screen TVs and a work desk. Each includes private bathrooms with power shower. * Price per person based on a twin share room. If you're traveling alone, AESU will attempt to arrange for you to share a twin at NO EXTRA COST. If you prefer a single room, a single supplement of $525 will apply. If we cannot arrange a 2-share room, the single supplement will also apply. Email Portugal to a friend!